Whitetail bucks that have survived through several hunting seasons follow their instincts when it comes to protecting themselves. They are smart and can elude hunters simply by doing what comes naturally. If you want a successful hunt, then you need to understand how bucks locate and maintain their ideal territory and how they respond to hunting pressure. Finding trophy bucks is a dream of most hunters. The best place to look for big bucks is wherever a funnel has been created by the terrain. A funnel is where a narrow strip of terrain is formed by the lay of the land. It can be created in several ways, one of the most common being by a creek or river. For example, a funnel is created by trees next to the river that connect larger tracts of forested land at each end. Or a funnel can be a narrow valley connecting two hilly areas or even a fence row connecting two woodsy areas. Whitetail deer will regularly travel any funnel that lies within their normal territory. That leads to the second point. Whitetail deer will almost never leave their territory. When hunting pressure gets intense, the deer will bed and become virtually invisible. Any hunter who has regularly walked hunting land has almost stepped on a deer which was laying low at some point. 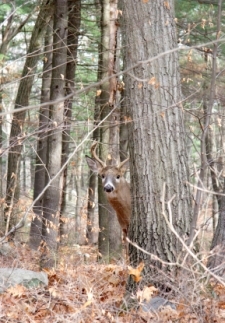 Whitetail deer will hide within their territory and not seek a new area. That means you have to look for them harder if you want to have a successful hunt, rather than moving to another territory. Funnels create the perfect traveling terrain for deer, while also providing ideal bedding areas. A successful white-tail deer hunter will learn how to hunt the funnel while also sticking within the original territory in order to have a greater chance at bagging the deer. 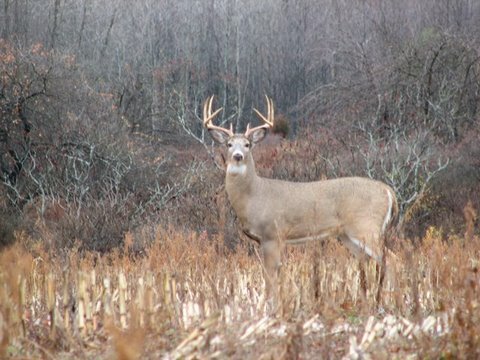 Whitetail bucks are experts at using their natural terrain to evade hunters. But their territory is actually quite small which means you just have to "think" like the deer in order to find the big bucks. That means staying in the same area and figuring out the most likely places within that area where the deer will be traveling and hunkering down when evading hunters.